Below is the technology industry news & trends report for June 2016. You can also check out our latest news & trends report to be in the loop of what’s shaping the tech industry landscape today. June was rich in events, deals, and other news. We decided to provide a short review in order to keep you, as well as ourselves, aware of the most important happenings. 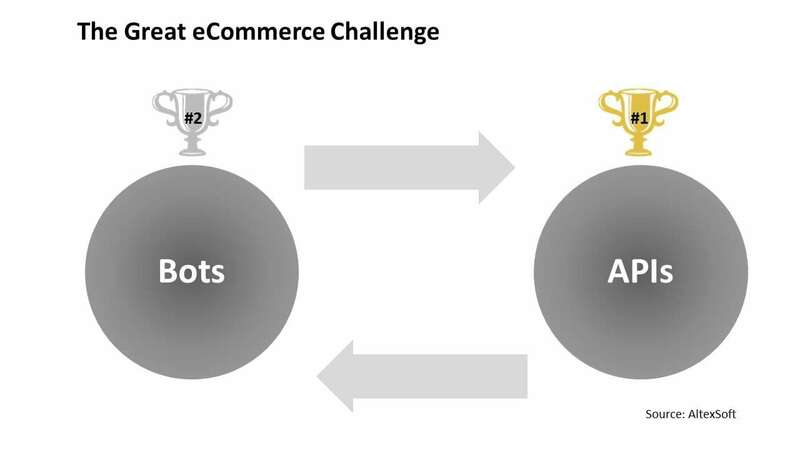 There is already a great demand for bots in eCommerce and consumer services. Venture Beat provides us with some perspective on how bot-to-consumer communication can turn into bot-to-bot communication, becoming the replacement for traditional APIs.Microsoft continues to support cross-platform development. The culmination of this process was the release of a cross-platform version of .Net Framework, which made it available on OS X and Linux platforms. Red Hat and Microsoft extend their partnership. The preview of SQL Server 2016 database software has already begun on the Red Hat Enterprise Linux (RHEL) distribution. 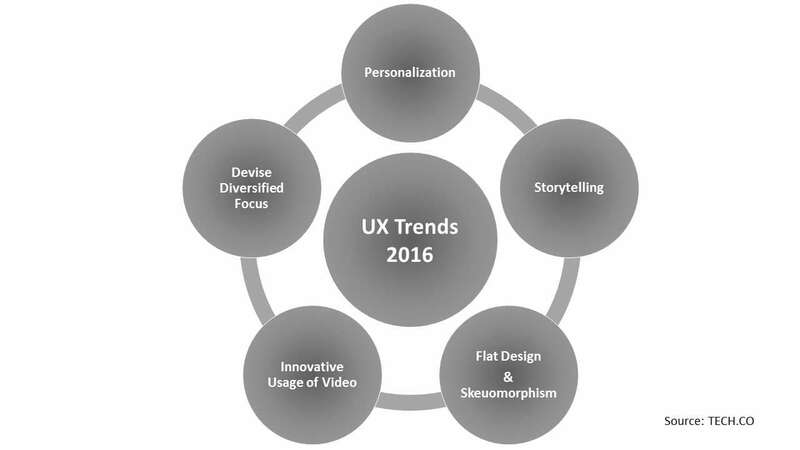 Tech.Co listed the Main Trends for UX in 2016. Among them are (1) The shift of the focus from screens to virtual reality, augmented reality, wearable technology, smart homes, and other technological advances. (2) The personalization for the different consumers driving UX. (3) The further experience personalization, as each group of users has their specific needs. (4) Designers will try to use videos in their work more often and in novel ways. (5) The continuing demand for storytelling in design. (6) The introduction of flat design 2.0. This month, Google launched a mobile-friendliness testing service for the small businesses. It assesses websites and provides a comprehensive report, which may be used by developers. SAP and Yandex Data Factory signed a partnership agreement. The cooperation will be focused on developing cloud-based predictive analytics services for retail, eCommerce, banking and telecommunications sectors. This partnership reinforces the fact that real-time cloud-based analytics solutions are actively gaining momentum. 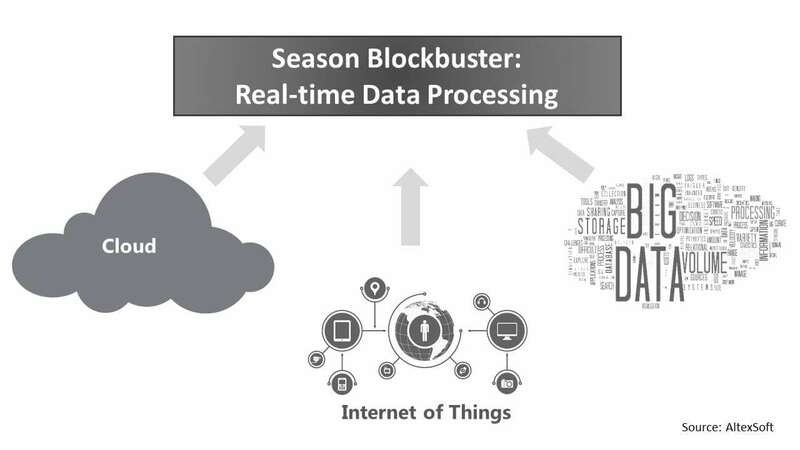 The access to real-time data might relevantly increase the capacity and some industries are more sensitive to time, such as security, agriculture, healthcare. The obvious proof of the importance of real-time cloud base data analytics is that Monsanto (the large crops and seeds supplier) has invested $11 million in Resson, a data-driven agriculture technology company, which helps assess crops’ status and health, and provides forecasts in this area. We think that such a system will become more and more popular in the near future. The demand for food is growing and agricultural businesses should look for solutions that might boost their productivity. The Darktrace, a cybersecurity startup that uses machine learning to detect security threats, is intensifying its global expansion. It has successfully raised $65 million for this task. The project is growing fast (with the number of employees increasing from 300 in 2013 to 1,000 in 2016). The core product was developed by Cambridge University specialists and based on a new branch of Bayesian probability theory. The new cyber security system by Darktrace works as an IT immune system for enterprise, detecting IT threats with AI. MIT’s Computer Science and Artificial Intelligence Lab designed the AI system that could pass the Turing sound test: When shown a silent video clip of an object being hit, the algorithm can produce a sound for the hit that is realistic enough to fool human viewers. Researchers expect that in the future, such algorithms will be used to produce sound effects for movies and TV shows. Salesforce released App Cloud Mobile, a no-cost addition to its software arsenal. 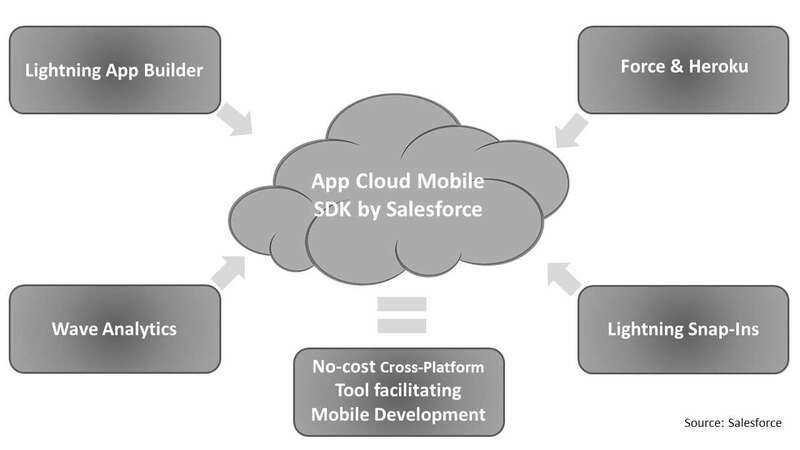 The solution unifies several Salesforce pieces: (1) Point-and-click programming tool Lightning App Builder, intended for use by non-techies, whom Salesforce calls business users. (2) Coding environments Force and Heroku, which permit the use of several development languages, intended for use by IT staff and developers. (3) Wave Analytics and Lightning Snap-Ins. This release should simplify the platform integration and implementation for the end users by making it possible for non-developers to implement the solution as a part of the company business process. Microsoft was recognized as one of the leading mobile apps development companies in 2016, according to Gartner. Such results were achieved due to Microsoft being available to the large .Net Framework community through Azure and, since recently, Xamarin platform, which is currently actively being integrated in Microsoft products. Many analysts agree that the mobile apps market boom has ended and it is reaching the maturity phase of its life-cycle. Further growth will be primarily sourced from deeper engagement with applications, but not the increased number of installs. The only part of the mobile apps market that will not be affected by this trend is mobile games. IDC predicts the US Internet of Things (IoT) market (hardware, software, services, and connectivity) will be worth over $232 billion. 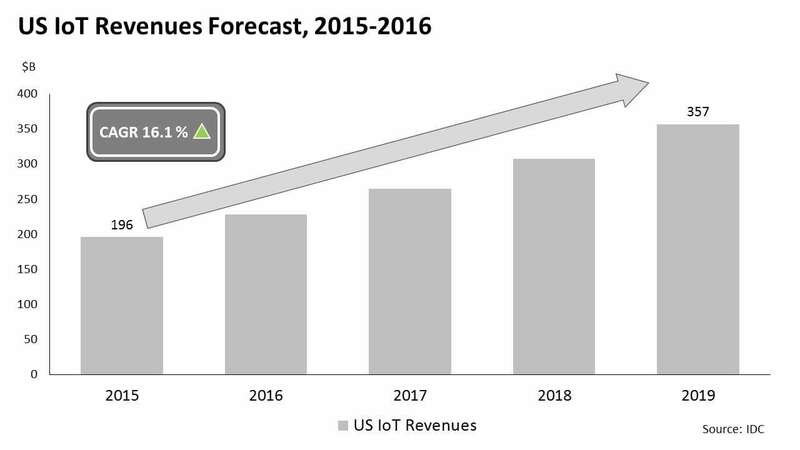 It expects the US IoT revenues to enjoy an average annual growth rate of 16.1 percent, hitting more than $357 billion by 2019. Samsung announces that it will invest $1.2 billion in the US IoT startups over the next 4 years. Together with the recent acquisition of Joyent, a public and private cloud provider, this is yet another step on the way for Samsung to become an IoT industry front-runner. The IoT will be strongly supported by technological development in the related areas. Bluetooth Special Interest Group is preparing the Bluetooth 5 standard for release later this year or in early 2017. The appearance of a new Bluetooth means the increase in a number of connected devices. Nokia is extending its device management leadership into IoT with the launch of the Intelligent Management Platform for All Connected Things (IMPACT), giving operators, enterprises and governments a secure platform on which to scale new IoT services. IMPACT handles data collection, event processing, device management, data contextualization, data analytics, end-to-end security and applications enablement for any device, any protocol and across any application. The strong side of the platform is supporting 80,000 device models from 100 of the world’s top manufacturers and the ability to add on-demand server capacity to support massive numbers of connected devices. Google promotes its cloud services through US universities, thus expanding their reach. Amazon claims that cloud consumer will stop weighing cloud services of numerous vendors, and turn to only one vendor. 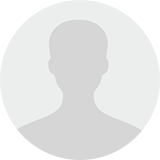 Therefore, the competition for the client between the cloud vendors is expected to be increasing in the coming years. 51maps – A startup providing a platform that allows enterprises to integrate all applications used by an employee into one dashboard. The dashboard is secure, easy to use and can be accessed from any device. AlphaPoint – The product provides a platform to store, track and trade digital assets with the help of blockchain-enabled solutions. Cambridge Blockchain – An identity management platform which allows financial institutions to meet data privacy rules, at the same time eliminating redundant identity compliance checks. By using blockchain technology with an off-chain personal data service, the solution is able to create an independent source of trust through the network effect. ForwardLane – The startup uses AI to provide personalized Wealth Management solutions to everyone. Using their technology, organizations can access capital market data, news, research, proprietary data and client information to receive necessary summaries and personalized advice. Quarule – The team behind this product understands that the requirements for risk management and compliance increase year by year. This in turn requires larger teams, higher costs and, what’s more even important, – more inefficient mechanical work. The company’s solution allows a user to automate the process in such a way as to retain and reuse knowledge capital to maximize returns on technology and staffing. Syndicated Loan Direct – This solution extracts information from existing debt documents to create financial information, allowing them to reduce analysis time and assist with faster trading decisions. T-REX – An enterprise SaaS platform that provides tools for risk analysis and valuation of assets to renewable energy industry. The company’s goal is to provide expertise, tools and opportunities to financial assets in renewable energy by enhancing transparency in structuring investment packages. Untapt – A data-driven recruitment platform, that uses data science to match quality technologists with hiring managers. The system behind it analyzes complete candidate and hiring team data sets to create precise connections. This allows companies to solve the critical industry pain points. Bank of England (BoE) launches FinTech accelerator. PwC is one of the first companies to partner with the accelerator on distributed ledger project. “If distributed ledger technology could provide a more efficient way for private sector firms to deliver payments and settle securities, why not apply it to the core of the payments system itself?”, said Mark Carney, governor of the BoE. 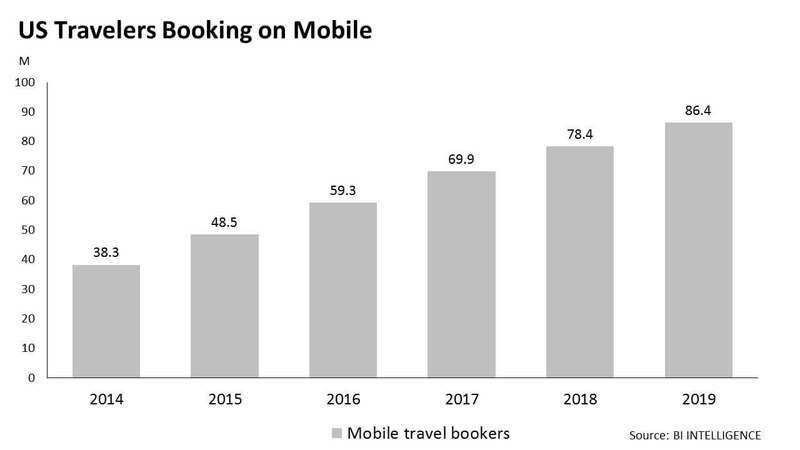 The experts expect 70% of the US digital bookings to come from mobile devices by the end of 2019. This growth will be supported by widespread usage of bots. Bots are the new trend in travel and booking, with the travel agencies and startups actively developing chat bots for use on websites and in social networks. For example: (1) Expedia.com has launched a bot on Facebook Messenger to provide simple search, selection and booking for hotels. (2) Skyscanner uses a bot to help travellers find the exact flight with the booking organized through the Skyscanner website. (3) Kayak has rolled out a bot for Slack messaging system – just like Skyscanner, the user can search for the flight with the actual booking conducted via the website or mobile app. Specialized portals, such as Booking.com and HRS, are winning a greater share of the German online travel sales market. Other insights from an annual fvw Dossier show that overall German market growth is slowing while the demand for more individual offers is rising. The competition between traditional retailers and eCommerce is growing, with 93 percent of sales still taking place in-store. Yet, eCommerce has numerous competitive advantages. The startup Index, which received $19 million in investments, delivers software that collects card data and information about customer’s purchases drawing the portrait of the consumer. Based on this extensive knowledge, the company is able to target the customer with personalized promotional and marketing content. The survey shows that Switzerland requires the strong local B2C online marketplace. Is this a new challenge for Amazon or an opportunity for a local rival? UK consumers are expected to spend less on foreign eCommerce websites after Brexit. Accordingly, it is expected to become more complex to reach UK market for external players. London-based addressing platform startup what3words received $8.5 million in investments in addition to $3.5 million it raised in November 2015. In addition to the existing investors (Intel Capita, Force Over Mass Capital, and Mustard Seed) the logistics company Aramex took part in the second round of the project funding. The foundation of the business idea lies in the replacement of traditional postcode/zip codes with unique three words for each 3m x 3m squares of the Earth surface. The startup idea was already adopted in Mongolia as a national addressing standard, replacing the existing inconsistent system. Logistics and shipping startup, ShipBob raised $4 million funding from Hyde Park Venture Partners. ShipBob facilitates an online platform for e-commerce companies, providing them with an end-to-end product management, including inventory management, customer communication, and shipping, all withing one integrated dashboard. The company claims that it has some major e-commerce platforms, including eBay, Shopify, Amazon, and Magento, as its clients. Microsoft announced a partnership with MEDIAN Technologies in the rapidly growing precision medicine market to improve MEDIAN’s cancer detection, diagnosis, and monitoring methods with the help of Azure platform. IBM has a similar project in place – Watson for Oncology. Deloitte announced a new cloud-based analytics solution, Safely, based on SAP HANA. Safely is a real-time decision-making product that will be used in the processes related to drug safety control and analysis, implemented by pharmaceutical and life science companies. The marketing technology in the highest demand is email software, according to a recent study by dotmailer. 88 percent of global marketers use some type of email marketing software now.